The guys from Top Gear get all the luck. Or the guys from the UK get all the cool cars, or more like none of the US guys get the cool cars. 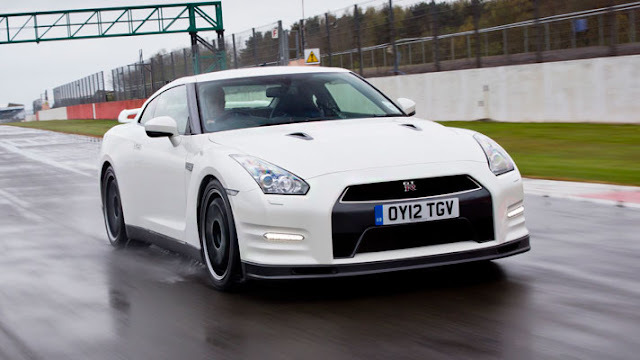 The track pack is a version of the Nissan GT-R, with some tweaks to make it more friendly to track time. Things like revised seats, wheels, titanium exhaust, and brake ducting. Kind of a SpecV without the 20k seats, and 50k brakes. The Track Pack takes all that power and grip, and slings it in a more focused package. About 15kg has been removed (the rear seats have been binned and the alloys are now lighter), the springs in the suspension have been stiffened, and the brakes have got new cooling ducts. The latter alteration can reduce the operating temperature of the brakes by as much as 100 degrees C - vital for a track day car. Less so for a road car.TP costs £10,000, pushing the total cost of the car to £84,450. If you want one, well, you have to move to Europe.